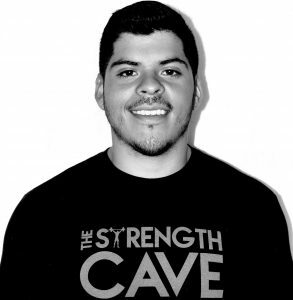 Andres is the head coach, founder, and owner of The Strength Cave where he works with clients of all levels to reach their full potential. Fueled by his personal journey from obese teen to powerlifting champion, he continues to consume as much information as he can with respect to exercise, nutrition, and coaching. After receiving a B.S. in Kinesiology at Arizona State University, Andres completed a Master’s Degree in Exercise Science at the University of South Florida and has completed several research projects as part of his studies. His goal is to blend science and research with real world application in order to offer the best package possible for his athletes. Daniel is a coach and founder of The Strength Cave who is currently serving as a Sports Scientist and Strength & Conditioning Coach for the Phoenix Suns. Before a career in physical preparation, Daniel entered Pennsylvania State University as a Fine Art Major. While consistently involved in athletics, Daniel eventually gravitated toward Kinesiology and Human Physiology. After beginning his coaching career at Crossfit Center City (Philadelphia, PA), Daniel made his way to University of South Florida where he received a Master’s Degree in Exercise Science. At his core, Daniel is driven by the desire to ask better questions and make complicated problems simpler.